Free dinner every night you stay with us! Aquarius Backpackers is located on Byron Bay’s iconic Lawson Street, and only 100m from the world famous Main Beach! We have lots of super cool awesome activities includes in your stay here at Aquarius great High-Speed WiFi, Ping-Pong table. We have nightly Entertainment with some amazing prizes up for grabs. There is also a Shuttle Bus to and from Byron Bay Terminal. PlayStation Gaming, Foosball, Beach Games, Boogie Board Hire, Travel and Entry into partner nightclubs, Live Soccer Matches. Come and relax and soak up the sun next to the Swimming Pool with Licenced Bar with the Cheapest Drinks in the Bay. Discounts through our in-house Happy Travels Booking Operator, On-site Laundry Facilities. We are located just seconds from shops, restaurants and the beach, Aquarius is the only hostel in Byron Bay to offer an on-site cafe and bar! Check out our happy hour deals – the best in the Bay! All guests receive special discounts simply for staying here – just ask our awesome crew members for more info! Would you like someone to cook for you? Look no further! Stay with us, and receive a free (Yes, Free!) nightly dinner, and an authentic Aussie BBQ lunch on a Sunday! ALL meals include a meat or vegetarian option. Aquarius Resort has the most spacious dorm rooms in Byron Bay, ALL of which are equipped with en-suite facilities. Time to relax? Why not chill out in a hammock on our sundeck; you deserve it! 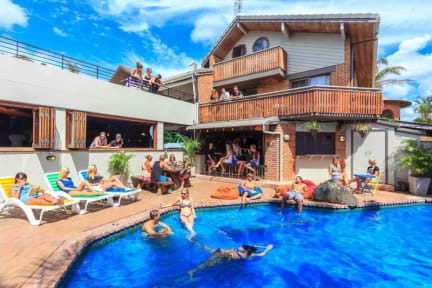 Aquarius Resort Byron Bay has a wide range of accommodation options, including dorm rooms, female-only rooms, backpacker doubles, private rooms and luxury motel spa suites. We can’t wait to show you some true Aussie hospitality! During our Christmas / New Year period (24th December – 6th January), and Easter Period, please note that there is a 3 night minimum stay, with full payment required at time of booking. No refunds or changes.